Charlie's first contract, age seven. I’ve been branding and running businesses since I was able to dress myself; choosing basketball gear and cargo shorts (we all have our low moments) over dresses and skirts. Personally, I’ve experienced the world in many forms: Midwesterner, soft butch lesbian alumni, three-time Elvis Halloween participant, vintage motorcycle mechanic and enthusiast, temporary Italian, and now Los Angeleno just to name a few. This continuous adventure of experiencing the world as a transman has only furthered Americano’s mission of helping brands and individuals bring their true, authentic messages to life. Kids truly do the strangest things, and in my case I was no different. I wrote my first contract when I was seven years old that employed my younger brother at my imaginary Pokemon drawing firm for a whopping $5/month. I would spend my days making and remaking various forms of packaging and designing layouts as a kid. Eventually I went digital and obtained my first copy of Photoshop around age thirteen so that I could make myself look more masculine—using design to show my authentic self. My goal for every project is to provide fearless, high-quality branding and design that never chooses safe over real. After all, nobody ever starts a business to look like everyone else. Charlie at "work" in a suit and tie, recreating VHS packaging. Charlie's household newspaper, age eight. 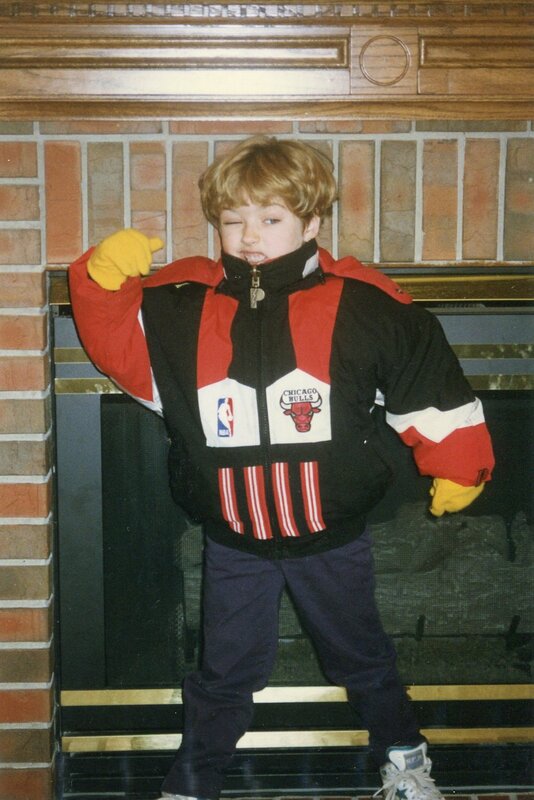 Charlie as a kid, with basketball gear of choice.